... excellent 9-part review of the Internet's history and its relationship with the information revolution . Very informative and quite amusing at times too! The Page 1 of the 9 pages' Story. 1866:" In the beginning was the Cable..."
The Atlantic cable of 1858 was established to carry instantaneous communications across the ocean for the first time. Although the laying of this first cable was seen as a landmark event in society, it was a technical failure. It only remained in service a few days. Subsequent cables laid in 1866 were completely successful and compare to events like the moon landing of a century later... the cable ... remained in use for almost 100 years. ... A must for someone researching the evolution of the Net. If you've never wondered how the Internet came into being then go anyway. You shouldn't be such a barbarian. It is clear that the Internet is one of the most fashionable areas of computing. It is effecting all subjects in Higher Education, not only altering teaching opportunities because of its new perspectives on communication and dissemination, but also opening up exciting new resources for students and lecturers alike. For a history of the Internet readers should consult Gregory Gromov's The Roads and Crossroads of the Internet's History. 1. Road #1 "Information Age�s Milestones"
3. Road #3 "The 50 Years of the Hypertext Concept�s Evolution"
7. The team should write two or three questions regarding the history of the Internet... Write your questions based on Gromov�s website. This is an entertaining (if potentially confusing) account of Net history, part of a large on-line hyperbook called View from Internet Valley, written by a California Internet consulting company called Internet Valley. You should only read this after you've become familiar with Net history, because if you start here you may well get confused. But if you know Net history, this site will provide some fascinating insights and connections between events and people. Estimated Surfing Time: at least two hours. Read through your history- wonderful! Hi, I don't mean to be mean, but your website is very hard to understand. Next time you make a website about the history of something, don't jump around as much! You confused the hell out of me. This site is a genuine pleasure to use! Thank you. ... This site is skitzo man. A box of rocks is better organized. read left to right instead of up, down, right, down, left, link, back, up, thread, 12pt, 18pt, 10pt. Yeah, that's all I remember ..
Read The Roads and Crossroads of Internet 's History, Gregory R. Gromov, et al. This is a hypertext of nine main pages with side links. It is written as a kind of mosaic rather than as a straight narrative, including email questions and answers, fragments of interviews, and the like. It focuses primarily on the Web and hypertext over the Internet. As well, it plays with typographical design and page layout in curious ways. ... I believe that your site has some useful information but, quite frankly, I'm not even going to read it. The indiscriminate use of font sizes, font types, colors, and spacing gives mean absolute headache. I am looking for resources on the history of the internet. I will not include any of your reportings. It seems like a great piece of work, although I cannot trust the reliability of it. You've misspelled and mistyped an amazing number of words throughout. Are you a 12 year old? I am very interested in the history of the net, that's why I came to your site, but the way you put it together is really annoying. <B>Bold</B> and <I>Italics</I> every other word really gets on your nerves. It would be a lot easier to read if you didn't overuse these. If you love those tags so much, save them for when only you are looking at them, because to everyone else, they are just showing how stupid you are. What better starting point is there in trying to understand the internet and the World Wide Web than to use the internet to explore its history. There are several web sites covering this topic. Here is one for you to explore, The Roads and Crossroads of Internet 's History by Gregory R. Gromov. This does not necessarily mean it's the best one, but it is an excellent history of the internet and a good example of a "web document." As you begin reading the document, you should soon discover that "reading" this web document is not like reading an article in a book or journal. Visually books and journals have pretty standard layouts and styles, though there is some variation. But one would be hard pressed to find any standard layout or style for web documents. You also should experience what "hypertext" is and why this experience is more like exploring than reading. But just like an exploration, it is up to you how extensively you explore. And just like any explorer you may end up "lost." Don't panic, just click on one of the links at the top of the window to return to one of the "pages" in the document. There are links at the top to each of the nine parts to this document. -an understanding of the history of the internet. -the experience of exploring a topic through the internet. My name is Tehmus Mistry and I am a lecturer of new media at Manukau Institute of Technology in Auckland New Zealand. I found your article " History of Internet and WWW: The Roads and Crossroads of Internet History by Gregory R. Gromov" through a search engine and started reading it. However, I found the presentation style extremely hard to read and this unfortunately has been the hindrance to reading the article and enjoying the articles content. I can see the style and emphasis the article is trying to achieve. difficult. A more classical approach could achieve the same result with without making reading of the article a chore. with regards to the history of the Internet, it would be appropriate to make the article an enjoyable read and less of an eyestrain. If you feel you do not have the time to change the look and feel, I will be happy to assign the task to one of my students to change its look and feel. Your Internet history website is freaky. The fonts and colors don't look like anything I've ever seen. I like it! Thank you for telling the history of the internet in a manner that I could comfortably read, follow and understand. You guys were obviously in touch with your potential target audience. The Roads and Crossroads of Internet History by Gregory Gromov is a nine-part history of the �Net posted by Internet Valley, Inc. While possibly not the first place in the pool where a non-swimmer should take the plunge, this colorful and quirky site can be a great resource where an informed �Net surfer can come and let hypertext do the walking and the inventors of the �Net themselves do the talking. Many visitors have found the eccentric choices of typeface and color to be disconcerting, but it�s worth clicking around here. snippets of World History as well. His approach may seem confusing, even messy at first glance, but give it a moment, you'll see how he weaves the history of the Web together. It's creative, it's informative and it's well done--it's what the Web is all about. President Dwight D. Eisenhower saw the need for the Advanced Research Projects Agency (ARPA) after the Soviet Union's 1957 launch of Sputnik. 1957 - October 4th - the USSR launches Sputnik, the first artificial earth satellite. 1958 - February 7th - In response to the launch of Sputnik, the US Department of Defense issues directive 5105.15 establishing the Advanced Research Projects Agency (ARPA). The organization united some of America's most brilliant people, who developed the United States' first successful satellite in 18 months. Several years later ARPA began to focus on computer networking and communications technology. In 1962, Dr. J.C.R. Licklider was chosen to head ARPA's research in improving the military's use of computer technology. Licklider was a visionary who sought to make the government's use of computers more interactive. To quickly expand technology, Licklider saw the need to move ARPA's contracts from the private sector to universities and laid the foundations for what would become the ARPANET. To appreciate the import ante the new computer-aided communication can have, one must consider the dynamics of "critical mass," as it applies to cooperation in creative endeavor. Take any problem worthy of the name, and you find only a few people who can contribute effectively to its solution. Those people must be brought into close intellectual partnership so that their ideas can come into contact with one another. But bring these people together physically in one place to form a team, and you have trouble, for the most creative people are often not the best team players, and there are not enough top positions in a single organization to keep them all happy. Let them go their separate ways, and each creates his own empire, large or small, and devotes more time to the role of emperor than to the role of problem solver. The principals still get together at meetings. They still visit one another. But the time scale of their communication stretches out, and the correlations among mental models degenerate between meetings so that it may take a year to do a week�s communicating. There has to be some way of facilitating communicantion among people wit bout bringing them together in one place. Around Labor Day in 1969, BBN delivered an Interface Message Processor (IMP) to UCLA that was based on a Honeywell DDP 516, and when they turned it on, it just started running. 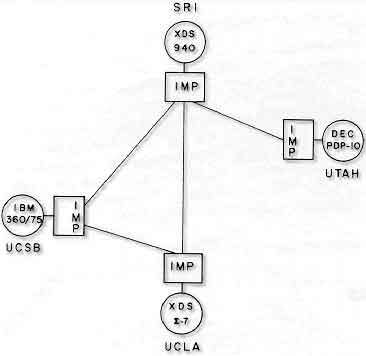 It was hooked by 50 Kbps circuits to two other sites (SRI and UCSB) in the four-node network: UCLA, Stanford Research Institute (SRI), UC Santa Barbara (UCSB), and the University of Utah in Salt Lake City. The plan was unprecedented: Kleinrock, a pioneering computer science professor at UCLA, and his small group of graduate students hoped to log onto the Stanford computer and try to send it some data.They would start by typing "login," and seeing if the letters appeared on the far-off monitor. "Do you see the L?" "Yes, we see the L," came the response. "We typed the O, and we asked, "Do you see the O." "Yes, we see the O." In late 1971, Larry Roberts at DARPA decided that people needed serious motivation to get things going. In October 1972 there was to be an International Conference on Computer Communications, so Larry asked Bob Kahn at BBN to organize a public demonstration of the ARPANET. The demo was a roaring success, much to the surprise of the people at AT&T who were skeptical about whether it would work. Around about 1973 - 1975 I maintained PDP 10 hardware at SRI. I remember hearing that there was an ARPANET "conference" on the Star Trek game every Friday night. Star Trek was a text based game where you used photon torpedos and phasers to blast Klingons. 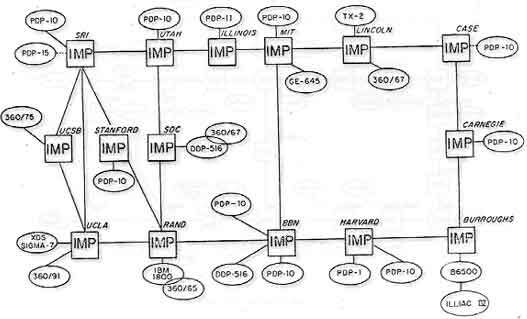 It seems we found "a pretty cool logical map of the ARPANET" which Bob has kindly reminded us about . Thanks, Bob! 1958 Advanced Research Projects Agency (ARPA) created by Department of Defense (DoD). 1961 Director of Defense Research and Engineering (DDR&E) assigns a Command and Control Project to ARPA. 1962 Information Processing Techniques Office (IPTO) formed to coordinate ARPA's command and control research. 1972 ARPA renamed Defense Advanced Research Projects Agency (DARPA). 1986 The technical scope of IPTO expands and it becomes the Information Science and Technology Office (ISTO). But could the Internet have performed the function it was originally designed for? There's a common myth that the Internet could survive a nuclear attack. If the Internet, or pieces of it, did withstand such a war, how would it be used post-apocalypse? Would the Internet itself be used to wage war? Would it become a sole source of information for the surviving masses? Or would it be too cluttered with dead sites and falsehoods to be worth anything? ... This question is somewhat stupid: In keeping with the Cold War theme, I'll end with a quote from Kruscheve (spelling): "In a nuclear war-the living will envy the dead..."
The point that I do want to dust off and raise again is that ARPA wouldn't have happened, if what used to be the Soviet Union hadn't shaken complacent U.S. awake with a tin can in the sky, Sputnik. Wars do wonders for the advancement of technology, and the Cold one was certainly no exception. The way to get a technology advanced is to gather a lot of really smart people under one roof and get them to concentrate on a single project. Of course, that takes some organization and money. Where does that come from? But that's another can of worms - to be opened with relish at a later date. In this case, it was the only body that had a stake in making sure the Net worked - the government. What with the Cold War in full swing and all, the military, specifically its think tank the Rand Corporation, was concerned that if the war ever got hot and large chunks of the country were vaporized, those phone lines (not to mention considerable segments of the population) would be radioactive dust. And the top brass wouldn't be able to get in touch and carry on. Thus the packets bouncing from node to node, each of those nodes able to send, receive and pass on data with the same authority as any other. It was anarchy that worked, and on a technical level, it still does, obviously. In 1957, while responding to the threat of the Soviets in general and the success of Sputnik in particular, President Dwight Eisenhower created both the Interstate Highway System and the Advanced Research Projects Agency, or ARPA. .by Steve Driscoll, Online Computer Library Center Inc.
"A term often used by the media to describe the Internet." Information Superhighway/Infobahn: The terms were coined to describe a possible upgrade to the existing Internet through the use of fiber optic and/or coaxial cable to allow for high speed data transmission. This highway does not exist - the Internet of today is not an information superhighway. information superhighway or I-way - this is a buzzword from a speech by Vice President Al Gore that refers to the Clinton/Gore administration's plan to deregulate communication services and widen the scope of the Internet by opening carriers, such as television cable, to data communication. The term is widely used to mean the Internet, also referred to as the infobahn (I-bahn). Tipper Gore:"When my husband Vice President Gore served in the House of Representatives, he coined the phrase "information superhighway" to describe how this exciting new medium would one day transport us all. Since then, we have seen the Internet and World Wide Web revolutionize the way people interact, learn, and communicate." Gore has become the point man in the Clinton administration's effort to build a national information highway much as his father, former Senator Albert Gore, was a principal architect of the interstate highway system a generation or more earlier. "By means of electricity, the world of matter has become a great nerve, vibrating thousands of miles in a breathless point of time ... The round globe is a vast ... brain, instinct with intelligence!" Samuel Morse was a professional painter whose talent in portrait work was well known. However, his career as an amateur scientist would soon overshadow his artistic endeavors. Morse went from painting to patents when he began investigating Joseph Henry's development of the electromagnet. Henry's success in sending the first electric impulse along a wire in 1831sent Morse to the drawing board to develop a way to use this discovery in the field of communications. distance of 37 miles. On May 24, 1844, the first telegraph message, "What hath God wrought," was successfully sent and received along the first telegraph wire system. In 1835, he developed the prototype of the telegraph, which used magnetic transmitters and receivers to send a pattern of signals across a wire. Two years later, Morse gave up painting to work full-time on his invention. He soon developed a language of signals called Morse Code, which used a combination of short and long signals called dots and dashes to represent numbers and letters in the alphabet. All that was needed was a network of wires to send messages across great distances. ... I opened by quoting Nathaniel Hawthorne, inspired by Samuel Morse's invention of the telegraph. Morse was also a famous portrait artist in the U.S.--his portrait of President James Monroe hangs today in the White House. While Morse was working on a portrait of General Lafayette in Washington, his wife, who lived about 500 kilometers away, grew ill and died. But it took seven days for the news to reach him. In his grief and remorse, he began to wonder if it were possible to erase barriers of time and space, so that no one would be unable to reach a loved one in time of need. Pursuing this thought, he came to discover how to use electricity to convey messages, and so he invented the telegraph and, indirectly, the ITU."